In college a new girl named Lily (Analeigh Tipton) is welcomed by a group of intelligent but neurotic females. The leader of this group is Violet (Greta Gerwig) whose is part of the college's Suicide Prevention Centre. The group is meant to help "less intelligent" people than the girls by getting them to realise their potential and to find happiness. But disaster strikes when she finds out that her boyfriend Frank (Ryan Metcalf) has been cheating on her with someone she was trying to help. She goes into a depressive state or what she calls a 'tailspin.' Meanwhile, Lily becomes more involved with a student named Xavier and his girlfriend and while they are out together one night a guy named Fred (Adam Brody), sends drinks over to her table. It becomes known that Fred is a made-up identity when he is actually a student in one of Violet's classes. 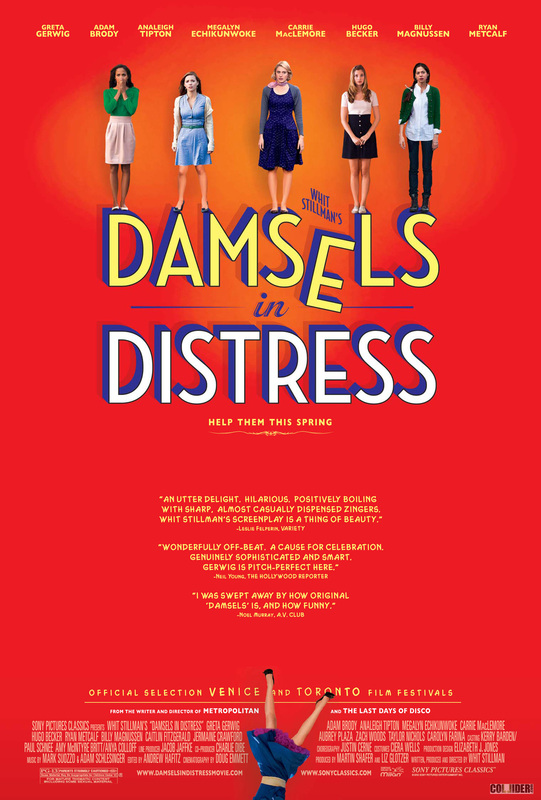 Damsels in Distress has been compared to the films of Woody Allen but it has more in common with Wes Anderson's deliberately self-conscious quirkiness and cryptic wordplay, only not as memorable. The success of Allen's best work is that he keeps the neurosis in the characters, but the situations are real and relatable. The comedy is grounded. Wes Anderson and similar filmmakers are ambitious in trying to bring that quirkiness into the situations to develop their themes. It's risky and some of the characters and the story choices made by writer-director Whit Stillman are utterly bizarre here. One of the girls' methods of therapy in the suicide prevention centre is to teach people to tap dance. Just like Wes Anderson's films, you either buy into this craziness or you don't. I thought the film was very funny, but only in patches, and lacking an arcing storyline, as well as fully realised goals for the central characters. Starting a new dance craze might be one of them but it's a bit too cute and sketchy to become invested into it. The film is really more like a series of conversations than a totally fulfilling narrative. There are some very peculiar relationships explored but even if that is the focus, like in say Manhattan (1979), a clear trajectory must still be intact. Some of the dialogue is interesting and funny but I also found it frustratingly cryptic and verbose, almost philosophical at times as well. A little credit is due here though: how many college films are there where the characters talk about 'male barbarism' or hilariously the 'decline of decadence'? When the film hits the right note, it successfully pokes fun of the characters' attempts to be both more intelligent and self-composed than anyone else. Finding a balance with a concept like this is tricky. These girls are meant to sound elitist and secluded and the dialogue characterises them accordingly. But there is the risk of also distancing the audience and at times I felt on the outside of what exactly they were talking about. The comedy is funniest when we see them as flawed people who think they are more in control of their lives than anyone else, an ironic touch that would make Woody proud. At the very least, the film is an example of straight-faced comedy. Greta Gerwig, who was inspired in Greenberg (2010), shows she has a gift for deadpan comedy, managing to keep a straight face and monotone voice all throughout this film. I'm looking forward to seeing her in Allen's To Rome With Love soon too. We learn that as a child, her character Violet suffered from obsessive compulsive disorder and that this has lead her trying to find a means of happiness that can be repeated in steps or as a cleansing ritual. I assumed that is why she tries to give soaps to one of the colleges or bizarrely is looking to start a new dance craze. Some of the males are hysterical too, especially Frank who has a fixation with a ball he left with Violent when their relationship went sour and Thor who hasn't learnt what primary colours are. Yet also like Wes Anderson's work, it requires a lot of guesswork amidst its kookiness. If the message is to find happiness in simple things, rather than over thinking our problems, than the movie is like the girls: in spite of some laughs, it goes about it the hard way.